The Front Door team recently attended an awards do, and as the sociable agency that we are, we joined in the celebrations with a few drinks - over which we discussed the idea of getting an office dog. I’ll be honest, I was completely horrified by this idea. The very thought of an excitable, breathless ball of fur bounding up to me each morning to sniff my unmentionables made my whole body shudder. You might have guessed by now I’m not a dog person - they are very cute and I get the principal, but I don’t want to look after one. As you can imagine, my views prompted an incredulous intake of breath from the rest of the Front Door team. They were horrified that I didn’t just love the idea. “How can you not want a lovely dog in the office?” came the cries ”Just imagine all the cuddling we can do…” Uh, no ta. So I thought about it in more detail; I decided to put my feelings aside and weigh up the pros and cons and see if there are actually any benefits to having a pet in the office…heck, who knows where this could go?! Pets reduce stress and improve morale: After a brief search, Nestle popped up as a well known brand that lets employees bring their dogs into the office, and according to this article in the Guardian, it’s not just a PR thing. After a three month probationary period and a certified PASSPAWT, the dogs are free to attend meetings and roam around sniffing each other. According to Nestle, it’s been proved that pets in the office can boost morale, reduce stress and improve communication between employees. If a big brand like Nestle is doing it, then that’s a definite plus. Hugs on tap: We all know what it’s like when you’re having a bad day and nothing seems to be going your way…but it’s not like you can pop over to the next pod and give Gary the data analyst a hug. So having a pooch on hand who not only likes you in their personal space, but welcomes it, wouldn’t that make every day a bit brighter? 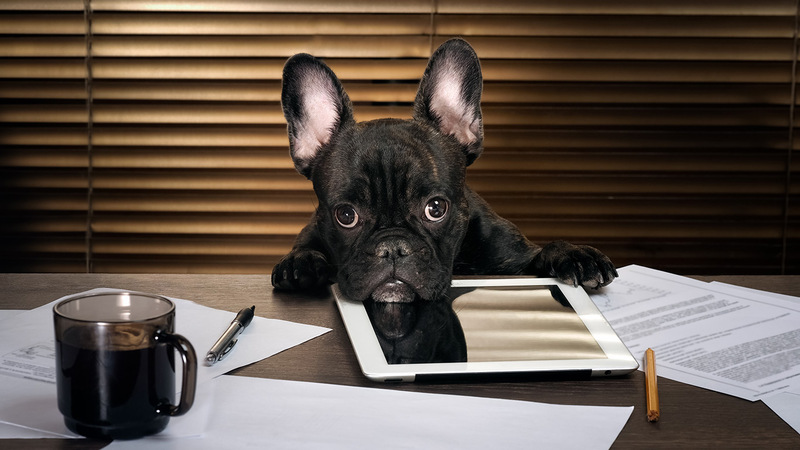 Sh*t is real: I asked Brooke Williams, CEO at proptech start-up and beloved client, Sorbet, for his opinion on the matter and he said, “I would love an office dog (only one which was toilet trained and didn't drop its hair). Our building doesn't allow them but we did ask! !” And it’s Brooke’s comment that reminded me – yes it’s a great idea in principal but, let’s face it, do you ever want it to be your turn to clean out the vivarium tank, sweep up hairs or God forbid, have to pick up a warm poo? They’re Not Safe For Work: Even with a PASSPAWT, the reality is we can’t stop dogs barking, sniffing or getting excited at a new visitor. Fellow Tec Marina inhabitant and PR manager for robo-investor, Wealthify, Mike Normansell, said, “Don’t get me wrong, I like dogs, but there’s a time and place for them and, for me, the office isn’t one. There’s enough sniffing, scratching, whining and growling going on in the average office without bringing dogs in to it too.” And ultimately, I’m with Mike, if it’s cuddles we’re after, should I bring my toddler into the office? I think she’s the most amazing person to walk the earth but she throws her food around and likes to draw on the walls. Is this acceptable at work? Probably not. So, after weighing it all up, whilst I can see that my difficult relationship with dogs is a controversial one out there in the real world, when it comes to offices, I think I’ll stand my ground. 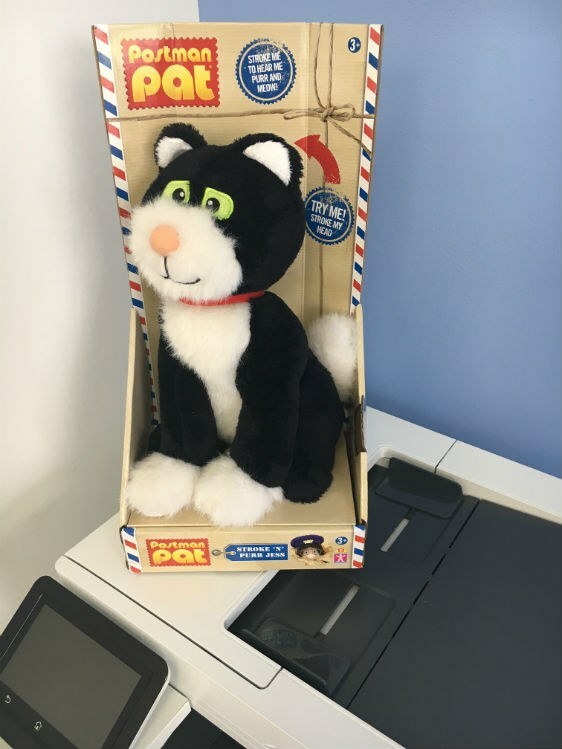 And as far as office pets go, this is about as far as I’m willing to go…. We welcomed A-level student, Nia Langford, to work with Front Door for a week and here's her take on it. If you're looking to recruit a communications agency, here are a few of our tips we've picked up along the way.